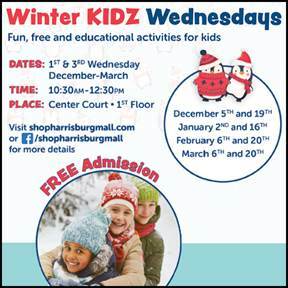 For all of you who loved Summer KIDZ Thursdays, Winter KIDZ Wednesdays was created to provide toddlers and young children who are not in school the opportunity to learn educational activities in a fun manner. These activities are typically hands-on or engaging for the children, and sometimes the parents as well. This program is free for families who want to participate and attend. Wednesday, January 2, join PA Leadership Charter School for crown decorating! Kids can color, sticker, and design a paper crown however they would like. Located in the center of the mall, first floor.